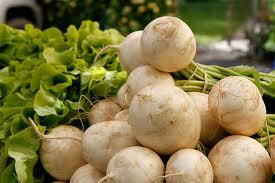 Turnips grow wild in Siberia and have been eaten since prehistoric times. Rutabagas are a cross between cabbage and turnip. 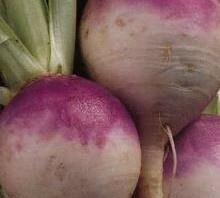 Turnips are easy to grow if sown in the proper season. They mature in two months and may be planted either in the spring, late summer or fall for roots or greens. The spring crop is planted for early summer use. The fall crop, which is usually larger and of higher quality, is often stored for winter use. Baked, Boiled or Steamed. Use turnips any way you would use a potato, and then some. Try them baked or boiled in stews, soups and stir-fries, or lightly steamed with some butter, salt or lemon juice for flavor. Julienne Them. Turnips make a great matchstick garnish for any dish. Just cut into really thin slices and garnish as desired. shredded raw turnips to salads. Sow Some Seeds. Get your kids interested in fruits and veggies by helping them grow something. Turnips grow easily and your kids may even be persuaded to eat them after harvest. Switch Your Greens! Use turnip greens as an alternative to cooked spinach or collard greens! They’re delicious sautéed or steamed as a side dish with garlic, onion, olive oil and lemon, or as an addition to soups, stews and pasta. Roast ‘em! Add a cubed turnip to your next pot roast or pan of roasted vegetables. beef or any poultry main dish. Turbo-Boost Your Stew. For an extra boost of nutrition and flavor, add turnips to soup or stew at the same cooking stage as you would potatoes.